If you have been injured on the job, there may be nothing more upsetting than having your employer’s insurance company deny a legitimate claim for benefits. 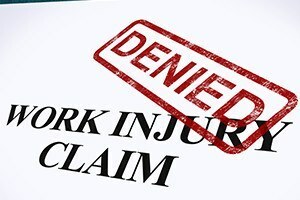 It is important to understand that at least half of all initial workers’ compensation benefit applications are denied. Many people whose applications are denied simply walk away, thinking that they have no further say in the matter. This is exactly what the insurance company is hoping you will do. Under the law, you have the right to dispute the denial via a four-stage process coordinated by the Massachusetts Department of Industrial Accidents (DIA). These are complex legal proceedings, and having a reputable workers’ compensation lawyer representing you can help to ensure that your interests are protected. At the law firm of Pulgini & Norton, LLP, we represent workers who have been denied the workers’ compensation benefits they rightly deserve. We have experience with cases at every stage of the process, and we know the best approach to help you reach a positive outcome. The following is a brief summary of the four stages of the dispute process and what you can expect as your case moves forward. Conciliation: The first stage of the dispute process involves a conciliation meeting that usually happens within 12 business days after the filing of your claim form against the workers’ compensation insurance company. You, your attorney, an insurance company representative and a conciliator from the DIA would all attend this meeting in an attempt to reach a voluntary agreement between you and the insurance company. Conference: The second stage of the dispute process involves your attorney and the insurance company representative making presentations to an Administrative Judge. Our attorneys submit documentation showing that you were disabled and that the injury or illness happened in connection with the performance of your job. After the conference, the judge will either order the insurance company to pay your benefits or indicate that it is not required to do so. Hearing: The third stage of the dispute process involves a formal hearing before an Administrative Judge. In most cases, it will be the same judge from your conference. This is a formal legal proceeding where evidence is entered and sworn testimony is taken. The judge will issue a decision either awarding benefits or denying them. Industrial Accidents Review Board: The final stage of the dispute process involves appealing the hearing decision to the Review Board. This option is available only if you can realistically contend that the judge made an error of law during the hearing or in the decision. These matters are reviewed by a three-judge panel that has the authority to uphold the hearing decision, reverse it or send it back to the Administrative Judge for further review. If none of these stages provides a satisfactory outcome, it is possible to appeal the matter to the Massachusetts Court of Appeals. At every stage, we will review the decision with you and give you an honest assessment of your chances of success at the next stage. We will not stop fighting if we feel that there is a possibility of winning benefits at the next stage. Contact our office today to schedule an appointment with one of our attorneys to discuss your case. We have offices in downtown Boston, New Bedford, Braintree, Hyde Park and Andover to serve you. We are available during regular business hours and by appointment at other times. You can reach us by phone at 866-767-8312 or via e-mail.